I had to move into a smaller place, and decided to use this desk at home. The larger desk that had been my home office would have been a tight fit in the new spot. 1) The cylindrical mortises and tenons don’t handle expansion and contraction well, so the legs were often either so loose they would wobble and practically fall out, or so tight that it was quite a struggle to get them in or out. Tapered conical joints would have been better, but no one makes a tapered tenon cutter this large, and I don’t have a lathe to make them that way. 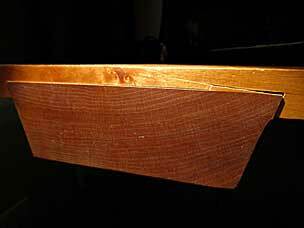 2) As I’ve bemoaned before, I did not let the cherry stock for the battens acclimate to the shop before milling. As they have dried, and especially in lower-humidity indoor environments, the battens shrink across their width, thereby loosening in the sliding dovetails and contributing to the wobbling (like the loose legs weren’t bad enough). That batten stock needs to be bone dry, as dry as it ever could be, before milling to fit the sliding dovetail sockets. 3) Three-quarters of an inch of alder is not stiff enough, without a stretcher or two running across between the battens. Maple probably would have been a better choice, but I was trying to reduce the weight of this desk I planned to lug around singlehandedly. Now living permanently in one spot at home, the desk works fine, although it does wobble side-to-side if I bump it. I still like the desk, it’s just not really so portable after all. And then this happened, during a period when the indoor relative humidity was down around 15–20%. The battens are only glued along the front here, maybe an inch back. All the shrinking of the top should have happened in the back, but since the batten wants to shrink as well, it pulled away from the dovetail socket corner.